The Love Chic Living garden is looking a little tired it has to be said. It’s been almost 10 years since we renovated it from a very rundown, traditional style garden into a space that we enjoyed spending time in. Children came along and some things had to change to accommodate a playhouse and trampoline but essentially the garden was still working. Until the last few years. A combination of lack of time and some harsh winters meant that many of our architectural plants died or have suffered from neglect. It really needs an injection of plants and to be more child-friendly too now the girls are a little older. So I am thrilled to announce that I’m going to be working with Homebase on the Garden Makeover challenge, and putting their ideas, inspirations and garden know how to very good use. So what problems do we face in the garden as it is today? Well, the general layout is pretty sound. The garden was created with different pockets; the patio, a gravel hotbed, the grass, and then the deck finishing up with a raised bed at the very end. This was before the days of the trampoline and we had various seating areas throughout the space. The decking is now home to the trampoline and the raised bed is pretty much hidden unfortunately. As I mentioned we have lost many plants in the last couple of years due to very low temperatures and now have ‘holes’ in the scheme where they used to be. 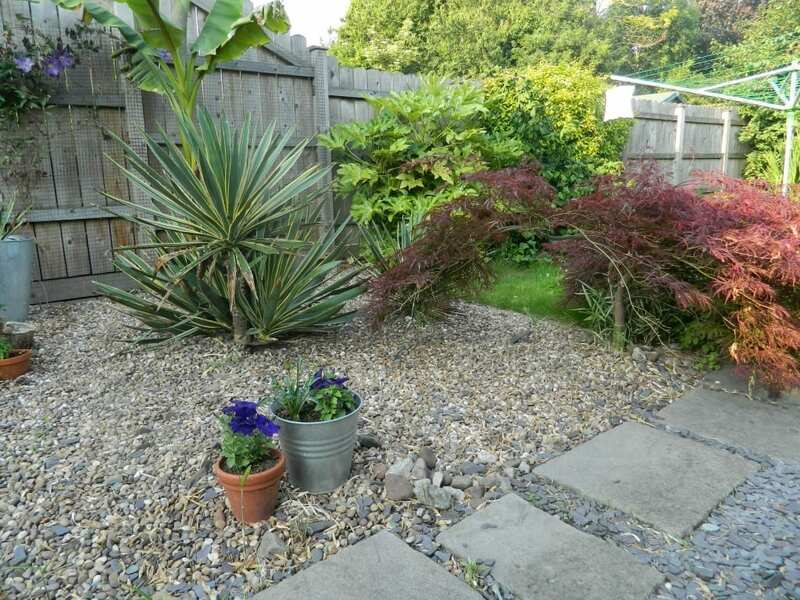 Other plants are very old and haven’t really been pruned or tended to as they should have and now need replacing. We have attempted to introduce some fruit plants into the garden and created a mini vegetable patch a few years ago to encourage the children to get involved. 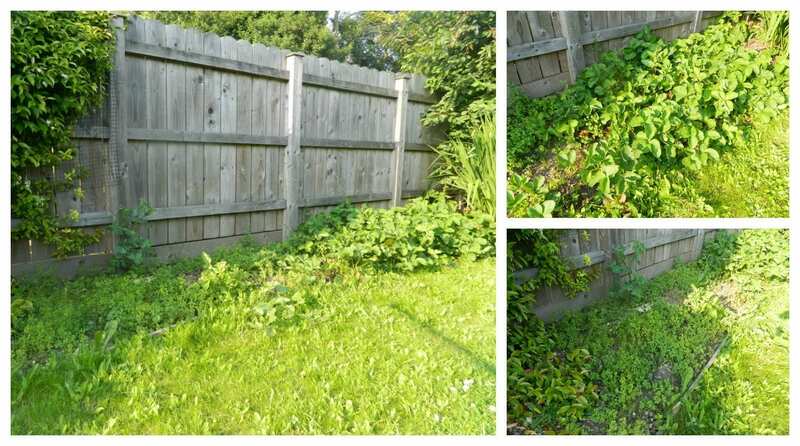 I’m ashamed to say it now looks like the strawberry plants are taking over, and due to a little neglect so are the weeds! This area really needs some attention as you can see. Believe it or not there’s some grass in there too. The raised bed behind the trampoline is far from attractive and we have started to pull out some of the dead and overgrown plants from this area already. Opening it up to create a blank canvas has really allowed me to envisage what we could do here and I’ve started pulling together a few ideas. It’s a very warm and sunny part of the garden so many plants could do well here. And finally, we have too many garden toys that the girls have outgrown so it’s time to scale them down allowing us to improve those areas too. 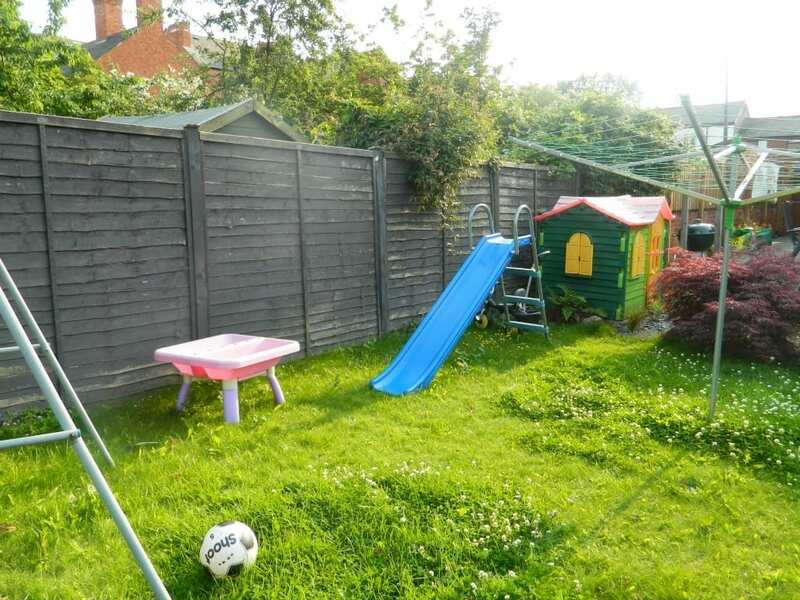 The slide and playhouse will go giving us room to add more interesting plants, paint the fence and nurture the grass into life. The playhouse area provides an interesting challenge as it’s a very shady spot so plant selection will need to be well thought through. I had been looking around Garden Shows online wondering how to make over the garden when I noticed that Homebase had won Gold for their garden in the Chelsea Flower Show. On closer inspection it seemed that my garden contained some of the basic elements used here and so may well be a good starting point for ideas. 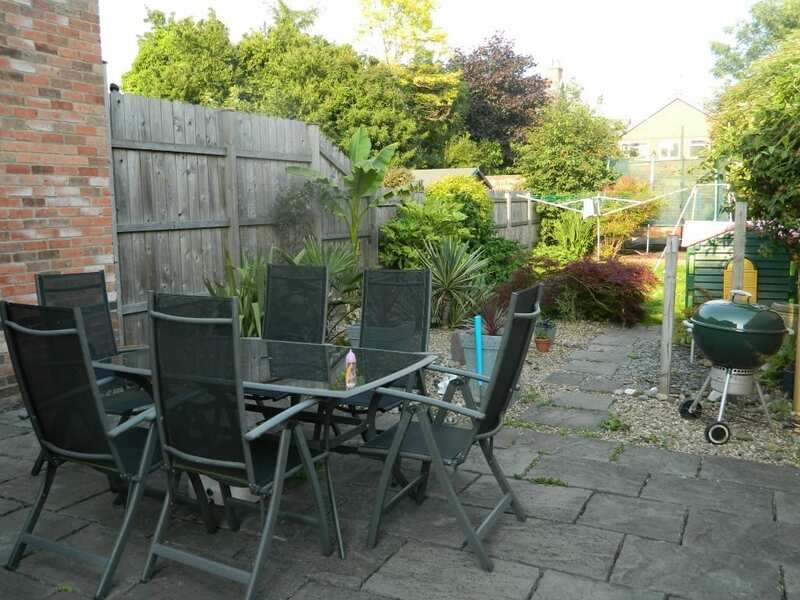 Billed as the modern family garden, providing a space to connect with the garden and nature it features areas for eating, relaxing and entertaining. Perfect! The designer Adam Frost has great vision and talks of how our children don’t necessarily have the experiences with nature that many older generations had and so he’s brought wildlife into his garden design. There’s really something for everyone in his garden and whilst I’m sure I can’t recreate this exactly, there are key elements here that will really work well for us. I’m also thinking I’ll adopt a more Mediterranean look with the planting which again fits well with the ‘pocket’ layout of our garden and will add some much needed colour and flowers. 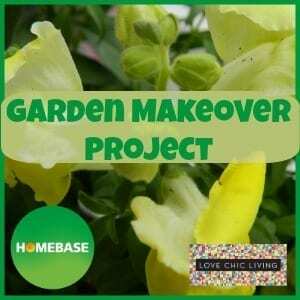 I am really exciting to be partnering with Homebase and working with their garden products. One particularly exciting point is the opportunity to try out their Garden on a Roll. As you have no doubt guessed we are not experienced gardeners, more the keen novice really, and this product is going to help us create a border any gardener would be proud of. Designed to fit the space exactly, the preselected plants arrive in a box, along with a bio-degradable garden plan, some tools and an instructional DVD. We will lay out the plan on the empty ground and plant according to the guide to create the perfect Mediterranean border. I just can’t wait! 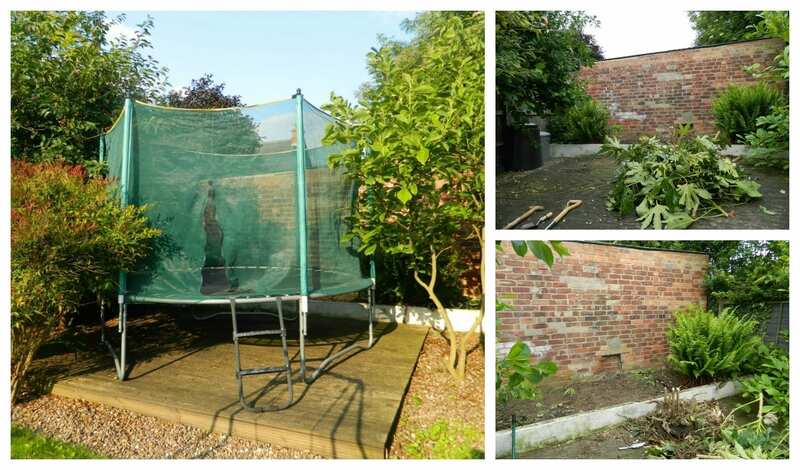 I will be blogging the progress of this, and the whole garden makeover across the next few months so do pop back to see how we are getting along. Love this Garden on a roll idea- have just been over to the Homebase site for a look. Can’t wait to see how it turns out Jen! Thanks Annie, I can confirm it is awesome as it’s just arrived! I suspect I have a busy weekend ahead of me. How exciting. I’ve never heard of the ‘on a roll’ idea, but it sounds a great idea. The hardest thing is figuring out the layout (apart from the pesky weeding) Can wait to see the results! Indeed Amanda, having the layout planned for you is just genius I think. I saw the garden on a roll on their website a few weeks ago and I’m so interested to see how this turns out. Good luck! Thanks Jenni, I have high hopes! Lovely ideas. Waiting to see how it turns out!